The Works and Genius of David Fincher: David Fincher's "The Black Dahlia"
David Fincher's "The Black Dahlia"
Big thanks to Gaelle for linking us to two interviews with Matz — and the courtesy of translating the Fincher bits. Thank you, Gaelle! That's awesome! Yeah, no, it should still be James Ellroy who receives the bulk of the praise. However, french graphic novelist Matz obviously opted to share story credits with none other than David Fincher for his graphic reimagining of the gory mystery tale. For francophiles this novel has been on bookstands since November 2013, and on how long the rest of us will have to wait for an english version? — I was not able to dig up any info so far. Here's the amazon.fr page. 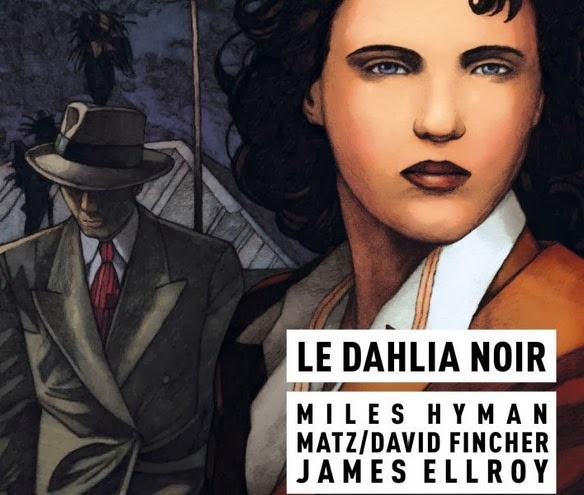 "Le Dahlia Noir", hell yeah. Q: Fincher collaborated with you on the adaptation of "The Black Dahlia", but you worked for a long time with him on a possible film adaptation of your "Killer". A: I have known David Fincher for several years - since the time when Paramount had an option on the film rights for my books "The Killer". David Fincher is a real fan of comics/graphic novels. In the course of our discussions, I spoke to him about my project to adapt "The Black Dahlia", and he told me that he had almost made a movie of it. It should have been a big movie starring Tom Cruise, but it didn't happen. The fact remains that David Fincher had already thought a lot about the adaptation, and I have to say that he had a completely decisive and absolutely crucial idea for the album, that of the "rule" we apply over the cutting of the story, that is this idea to create (in a very regular, almost obsessing way) three streak by page, of one comic strip "box" each. Of course, there are variations, but it is the rhythm of the album. And from the moment he told me about it, I saw that it was possible to adapt the book as a graphic novel and how I could do it. Then, we discussed certain sequences particularly difficult to synthesize. He really had a very important role, and without him, this graphic novel would not be what it is. Everything is well between him and me. I do not despair for his adaptation of "The Killer". I'm working on it. (From the second interview) Q: Is "adapting a story" a form of creation? A: Of course. I made the translation in both directions. First in French then in English for Ellroy to read it. The Black Dahlia is a very dense novel which forces you to choose "your" plots. We worked in duet with Miles Hayman and with Ellroy who validated the whole book. He was not very fond of the very idea of our project at first. But our graphic novel is not a by-product. We wanted it to be of high quality. Q: How did you work with Hyman and David Fincher? A: I made a very precise cutting, box by box. Every page consists of three strips with a rhythm very similar to a "movie rhythm". I worked in duet with David Fincher, which is quite a big deal, he wanted to make a film of "The Black Dahlia". His version with Tom Cruise would have been a three hours film. The producers backtracked. Fincher likes comics. We thought about the story. He had ideas on the cutting, in particular on the Mexican sequence. Drawings were also validated by Ellroy. I told you that the scenario was in English. I counted that in the novel there are 85 important characters. I kept only half of them. I assure you that I was worried when I sent the scenario to Ellroy. But what a pleasure it also was! Brian De Palma wound up directing the Hollywood adaptation of "The Black Dahlia", but as for thriller terrain I am not at all displeased Fincher found "Zodiac" to direct sort-of-instead. Make sure to snoop around the graphic novel's Facebook site (Gould, thankfully, put it in the comments below) for some artwork impressions, and let us know if you hear anything about a release en anglaise. Author say he worked in duo with Fincher to edit the book in a cinematographical way. Fincher had very precise ideas about the project, especially the mexican sequence. Ellroy also approved the final project. Also the idea of articulating the story by series of 3 strips comes from Fincher. Thanks for the shout out, it's good to see my name associated with the Master's name...! Any updates on if a English version is coming soon?